We're pleased to let you know that we're now holding Non-woven Bags in Stock for our Australian operation. Until now we were never really happy with the print re-production capable on Non-woven Fabric, but a couple of recent technological advancements has meant that the printing now reaches our exacting standards. 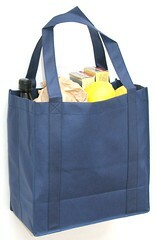 Here's our range of Non-woven Bags in Stock that are ready & waiting for your order. These can be printed & delivered within 2 weeks of confirming your order.